Hello there! I received this packaging as a gift and I guess I would have never bought it myself, even though I love coral blush and eyeshadows. But I can’t stand this shade on my lips! The texture is pleasant, runny but I can’t say that it’s watery. No, it’s more like a gel in consistency. Cha-cha, one, two, three! 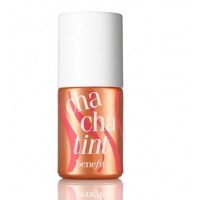 Bright and funny… and I don’t mean dancing, I mean a lip tint Benefit ChaChatint. Lip tints have won a special niche in my heart. Finally, I got a chance to test out one more lip tint from the Benefit brand. I started to get to know the product with a mini package, which I received as a free gift for a purchase in one of the beauty stores. A single stroke with an applicator and you have natural-looking and plump lips! Two strokes and you have flirtatious pink lips!